What is EAP? 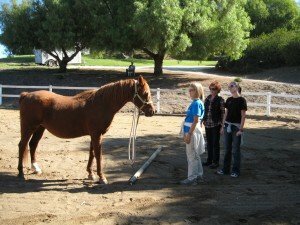 It is a therapeutic intervention approach using horses to incorporate experiential methodology with a relational aspect. EAP focuses on the nature of the horses, which removes the intensity of the client’s anxiety and allows one to relax into the present moment and access the subconscious. It breaks down barriers in a non-threatening manner, requires patients to develop fresh insights and new perspectives about old relationships and behavior patterns. It is a milieu approach allowing for direct learning and transfer to real life situations. What are basic assumptions? It is assumed that mere insight/ awareness into the nature of problems does not produce positive change by itself. Change best occurs from the process of translating insight into action through the active experiencing of new situations. This process serves as a metaphor for life and is essential for generalization and transfer. The counselor facilitates meaningful exchange of insights, thoughts, feelings, reactions and then co-constructs new stories and meaning. assists clients to identify and access inner capacity for healing and assume self responsibility; provides a non-threatening and motivating learning environment; empowers by giving sense of control; breaks down defense barriers; enhances problem solving skills; teaches empathy, responsibility and patience; provides immediate cause and effect situations; builds trust in relationships; stimulates creativity; increases internal locus of control; enhances attention; conveys lessons on an emotional level; promotes change from dysfunctional patterns through learning about firm, but flexible boundaries; instills trust; teaches consistent and effective communication; promotes teamwork; promotes patience and enhances adaptability. Why Horses? They are social animals with defined roles; their large size is intimidating, yet empowering; they are sensitive to nonverbal cues, require respect, are prey animals that run when threatened, find comfort in herds when under stress, masters of relationships, desire peace which allows relationships to be based on present behaviors and responses, are adaptive to change in social structure, show consistency between how they feel and how they act, have distinct personalities, moods and attitudes, like to have fun, provide direct feedback and act as mirrors to our behaviors. They allow for authenticity in the relationship. What are the Theoretical Orientations used with EAP? There are several major psychological approaches utilized within the paradigm of equine assisted psychotherapy. –Cognitive Behavioral Theory– this involves a restructuring of our dysfunctional thought patterns stemming from irrational beliefs. The interaction with horses can dramatically demonstrate how these beliefs impact our emotional responses and allow for active change to take place. -Reality Therapy- This approach emphasizes taking responsiblity for one’s own behavior and satisfying needs in ways that do not interfere with others. Successful interaction with horses requires that the client take effective control of their actions and accept the reasonable consequences of their actions. Horses are non-critical and non-judgmental and give direct feedback. -Gestalt Theory- This is an experiential therapy stressing here and now awareness with the focus on the what and how of behavior and the role of unfinished business from the past which prevents effective functioning in the present. The process of “re-owning” parts of oneself helps clients to become fully functioning individuals. Avoidance of this unfinished business is a major block to moving to healthy integration. Horses allow one to face these uncomfortable emotions. Focus on body language is an important component to this approach and horses are masters of giving this feedback. -Brief Therapy- It is short term, focused, strategic, solution-oriented, cost effective, time limited, and is often used to accomplish the following goals: improvement of most disabling symptoms as rapidly as possible, establish previous emotional equilibrium, increase coping ability in the future, and emphasis on strength and health. EFP can be utilized to give a rapid “kick start” to making initial changes, problem solving and developing goals. Relationships can be easily identified and re-structured in this type of interaction. Eight week sessions are often effective for instigating these changes. -Systems Theory- This utilizes the model describing how individuals behave in relationship within a system. Any change will ultimately affect the functioning of the entire system. The interdependence of the system requires each person to take personal responsibility within relationship to the others. Horses function within a herd and provide experiences of how relationships function within these systems. -Depth Psychology- Metaphorical learning using the archetypes of the collective unconscious is a natural element of EAP. The behavior of the horses provide rich opportunities to develop these thematic, symbolic stories that provide deep understanding to the client’s psychological/ emotional challenges. -Mindfulness Based Awareness- The deliberate paying attention to what is happening in the present moment allows one to access reality without the filters of judgment, expectations and the influence of dysfunctional beliefs. Interaction and observation of horses provide rich opportunities to experience the present moment and develop powers of focused attention, resulting in unfiltered awareness, peace and relaxation.